Mandler's: The Orginial Sausage Co.
After a morning of shopping, we stopped at Mandler's: The Orginial Sausage Co. for lunch on Saturday. The menu is surprisingly large, including 12 different varieties of sausages. 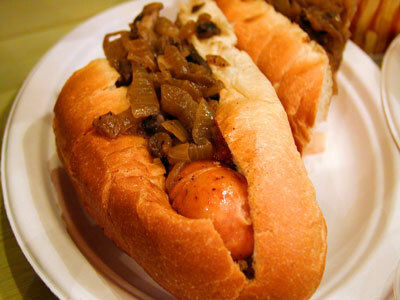 All sausages are served with either sauerkraut or sauteed onions and mushrooms, your choice of sauce and bread. We tried the Andoville ("Hot Spice Smoked Beef & Pork") and Kosher Beef ("Traditional NY Low Carb Sausage"). The Andoville served with Mandler's spicy sauce was pleasantly spicy -- not too tame and not so spicy as to cause discomfort. The sauteed onions and mushrooms were too well done for my taste, perhaps sauerkraut would have been a better bet. Mandler's: The Original Sausage Co.